Sands as soft and white as powdered sugar as far as the eye can see. Water that's always perfect and flat. Fresh east-blowing breezes. These are the things that make this one of the most celebrated beaches on the planet. Spend sun-kissed days playing on the beach, and moonlit nights dancing barefoot in the sand to sultry reggae rhythms. 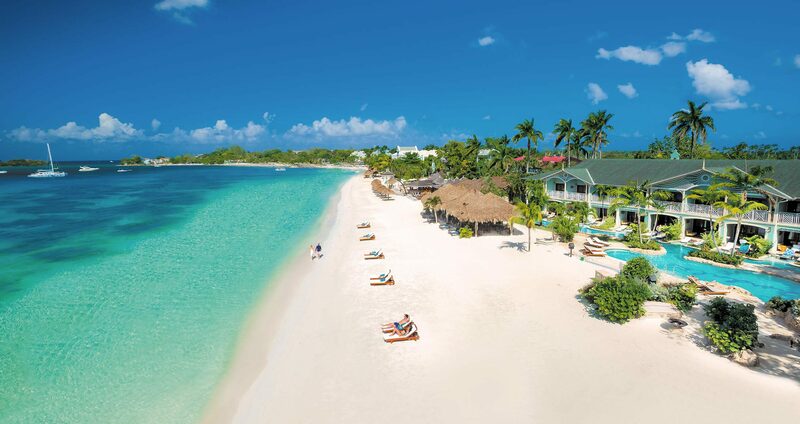 Every room at Sandals Negril is just steps from Negril's famous 7-Mile Beach. Featuring contemporary furniture, lavish spa-style bathrooms, and unique amenities, these rooms and suites are perfect for couples in love. New spacious rooms and loft suites in the stunning Coconut Blocks have been redesigned and now offer superb features including chic contemporary furniture, lavish bathrooms, and patios with beautiful coral stone floors, plus outdoor Tranquility Soaking Tubs for two. The Swim-up Crystal Lagoon Suites offer stunning ocean views and refined furnishings that create a restful oasis. Step from the soothing waters into a suite lavished with Italian glass mosaic tiles, designer fixtures, marble and mahogany. These Suites even include Butler service and 24-hour room service. Dine at 7 world-class restaurants including authentic Northern Italian cuisine from Cucina Romana, mouthwatering Jamaican fare at Sundowner, fresh seafood served right on the beach at Barefoot by the Sea, and plenty more options that will whet your appetite. At Sandals Negril you can enjoy four unique poolside experiences, including three freshwater pools and one dive certification pool. 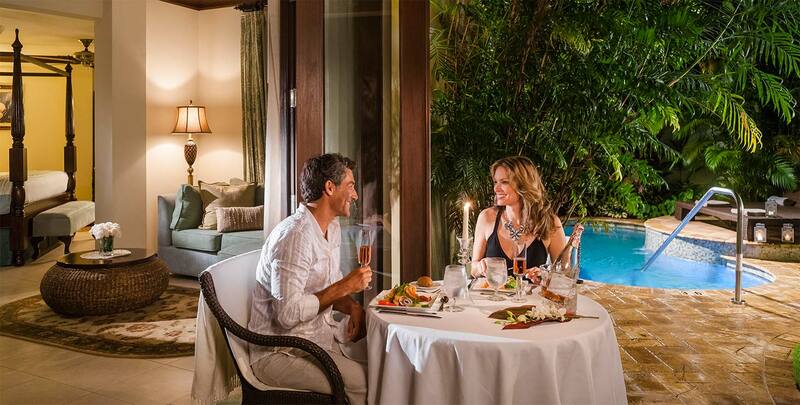 Swim up to the bar or reserve a poolside cabana where your butler will deliver cool drinks with a warm smile. Every room at Sandals Negril, from the stunning Two-Story Suites to the Millionaire Suites, is just steps from the powdery white sands of Negril’s famous 7-Mile Beach. Embark on a culinary journey around the world, where sumptuous cuisine is the perfect prelude to romance. There are seven scintillating specialty restaurants to choose from, each waiting to delight and surprise you. It's a global culinary extravaganza - and you'll never even have to leave the resort to enjoy it all. Sands as soft and white as powdered sugar as far as the eye can see. Water that's always perfect and flat. Fresh east-blowing breezes. These are the things that make this one of the most celebrated beaches on the planet.